Newschooltattoo.com carries a full range of Kuro Sumi Ink, available as sets or as individual colors. Ancient Yayoi Kuro Sumi Tangnuni warriors were considered an elite force in Japanese history. These warriors were bred to fight not only with their lifetime of training and skill set, but to use the heart of the dragon to pursue their opponents. These chosen few were distinguished with their bold markings found under their jaw line and abdominal region. Kuro Sumi led the Japanese culture with respect and honor. The way of the warrior and the powers of the Kuro Sumi were soon recognized to be supernatural. The Story of Yayoi Kuro Sumi Tangnuni will live on forever, just like the works of millions of tattoo artists around the world leaving their art permanently displayed under the skin of billions of people around the world. The research and development of Kuro Sumi tattoo products are top secret formulas that have been desended from centuries of Japanese tattoo artists. These formulas incorporate vegan friendly, purely organic elemnets. 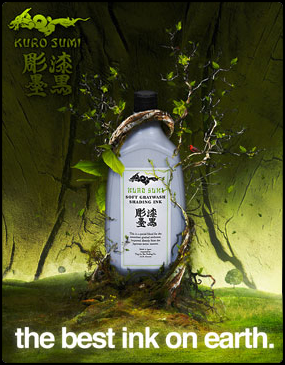 Kuro Sumi ink is made from the best stuff on Earth and will truely dazzle your customers with extraordinary results.